Blackburn, Glen A. The Papers of John Tipton. Ph.D. dissertation, Indiana University, 1928. Pershing, M.W. 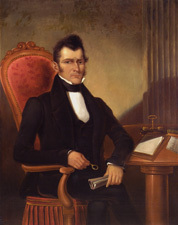 Life of General John Tipton and Early Indiana History. Tipton, IN: Tipton Literary and Suffrage Club, n.d.
Robinson, Nellie Armstrong, and Dorothy Riker, eds. The John Tipton Papers. 3 vols. Indianapolis: Indiana Historical Bureau, 1942. Tipton, John. The Journal of John Tipton. Indiana Quarterly Magazine of History 1 (1905): 9-15, 74-79. ___. The Tippecanoe Journal of John Tipton. Indiana Quarterly Magazine of History 2 (December 1906): 170-84.